Now that the Democrats have won control of the U.S. House of Representatives in this November's elections, do you think the country will be better off, worse off or will it not make any difference? Do you think the Republicans in Congress or the Democrats in Congress would do a better job of dealing with each of the following issues and problems? How about -- [RANDOM ORDER]? ^ Asked of a half sample; (vol.) = volunteered response; # WORDING: Global warming. 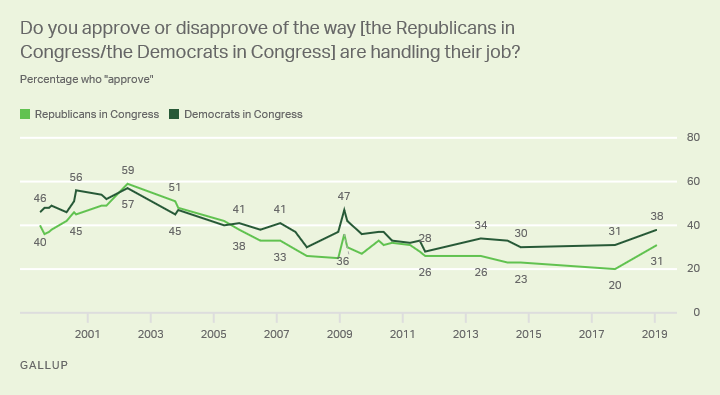 Do you think the Republicans in Congress are -- [ROTATED: too willing to make concessions to the Democrats in Congress, are about right (or are the Republicans in Congress) not willing enough to make concessions to the Democrats in Congress]? Do you think the Democrats in Congress are -- [ROTATED: too willing to make concessions to the Republicans in Congress, are about right (or are the Democrats in Congress) not willing enough to make concessions to the Republicans in Congress]? Do you think the government will work better now that the Republicans are in charge of the House of Representatives, will work worse or will be about the same? Now that the Republicans have won control of the U.S. House of Representatives in this November's elections, do you think the country will be better off, worse off or will it not make any difference? Thinking about Republican efforts to reverse the policies enacted by Democrats in the past two years, which concerns you more about the new Republican majority in the House of Representatives -- [ROTATED: it will go too far in trying to reverse the Democrats' policies, (or) it will not go far enough in trying to reverse the Democrats' policies]? Overall, how much do you think Congress has accomplished this year -- a great deal, a good amount, not too much or nothing at all? ^ Asked of a half sample; (vol.) = volunteered response. Do you think the country would be better off if the Republicans controlled Congress, or if the Democrats controlled Congress?